I sometimes wonder whether the real transformative force in contemporary writing isn’t digitization but fandom, and more particularly the technologies that underpin it. For while digitization is transforming the publishing landscape, the internet is breeding not just a new breed of highly engaged readers deeply invested in their particular area of interest, but also a new hierarchy of taste, founded not in traditional literary verities but in ideas of delight and generic awareness. Fandom’s rising power is visible in phenomena as seemingly unconnected as the hegemony of the superhero movie and the influence writers such as Neil Gaiman wield on Twitter. Yet it’s also visible in the rise of a new kind of fiction, one whose playfulness and generic promiscuity might once have seen it labelled post-modern, yet which more effectively elides the boundaries between high and low culture and art and entertainment than the writers of the 1980s could ever have dreamed of doing. A list of writers operating in this new space might include names such as Lev Grossman and Lauren Beukes. But it’s possible no writer exemplifies its possibilities better than English author Nick Harkaway, whose first novel, the post-apocalyptic Kung Fu picaresque The Gone-Away World was probably the wittiest and most bizarre satire on the War on Terror and the problem of personal identity you’re ever likely to read. Harkaway’s new novel, the doorstop-sized Angelmaker, is as difficult to summarize as it is to put down. A riotous, wildly inventive mish-mash of genres and seemingly contradictory ideas it manages the not inconsiderable trick of being both immensely entertaining and curiously heartfelt. At its centre is Joe Spork, the wrong side of thirty, single and owner of a failing clockmaker’s business in an unidentified “quiet, dingy bit of London down by the river.” Outwardly at least Joe is an Everyman, but like most Everymen, he has a few issues all of his own. The most significant of these is his father, Matthew, last of the great London gangsters and Prince of the nomadic collective of rogues and villains known as the Night Market, a man whose legend has long since overtaken the more problematic question of what sense his son should make of his father’s legacy. Yet as Matthew discovers when he is asked to repair a clockwork device of almost impossible sophistication, the Spork family has other legacies as well, not the least of which is the creation of a 1950s doomsday machine capable of eradicating possibility from the universe, a device which, once triggered, puts Joe in the sights not just of the maniacal Asian despot who has sought it for half a century, but a terrifying collection of government agents, psychopathic killers and hooded monks, all of whom want the device for different reasons. Much of the pleasure of Angelmaker lies in its sheer freewheeling excess. Rather like Neal Stephenson, Harkaway is a novelist whose fascination with ideas is coupled to a delightfully maximalist narrative sensibility, a combination that lends even his wilder flourishes (Clockwork bees! Identity transference! Secret thieves’ markets beneath London!) a giddy infectiousness. Yet for all its hyperactivity Angelmaker is also a curiously gentle, even tender book, possessed of a generousness and sympathy for the awkward and the obsolete. Like Joe’s failing clockmaker’s business, it is a book not just about people but a world out of time, suffused with a loving fascination for the forgotten, the handmade and the traditional. It’s also – although it seems somehow incorrect to mention it – difficult not to read it without one eye to the identity of Harkaway’s own father, David Cornwell, perhaps better known as John Le Carre. For while there is no question Harkaway is a prodigious talent in his own right, the surprisingly touching portrait of Joe’s struggle to come to terms with his father’s legacy cannot help but suggest at least an element of autobiography. None of this is to say it’s perfect. Certainly there are moments when the novel threatens to veer off track, and where Harkaway’s effusiveness lapses into prolixity. 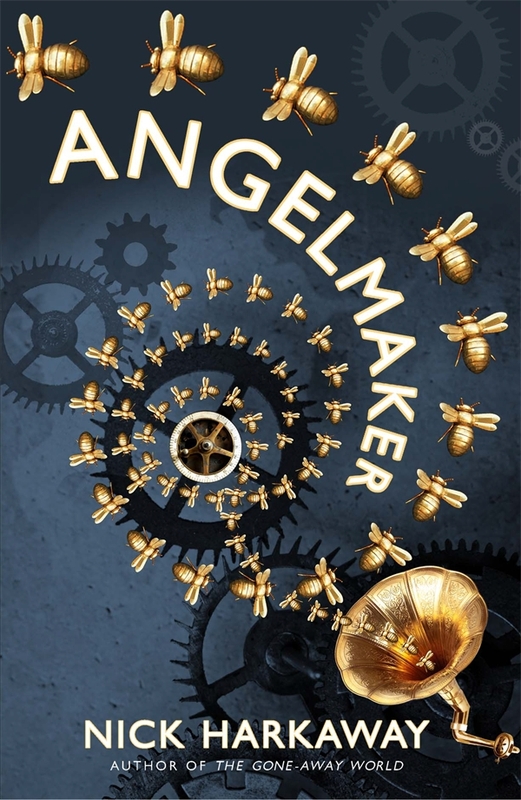 Yet these are faults of ambition as much as anything, testament not just to the wild over-abundance of Harkaway’s imagination, but to his preparedness to take the sort of narrative risks that make a book like Angelmaker possible. First published in The Sydney Morning Herald, 31 March 2012. My review of The Gone-Away World is available here.